Appliance makers are in the search for a potential successor to stainless steel, which some designers say will eventually wear out its welcome. But so far, no introductions have touched upon the popularity of stainless steel, and stainless isn’t likely to be doomed to the same fate as 1970s avocado-colored appliances anytime soon. Still, some home owners have complained about the annoyance of fingerprint smudges and the upkeep in keeping their stainless polished. Eventually, that annoyance may tempt them to look more closely at some of the alternatives popping up in the last two years. Some appliance makers are choosing to still channel the stainless look in their alternatives so that home owners could even make a gradual switch. Other manufactures, however, are opting to offer more bold alternatives. Could any of these finishes have the potential to dethrone home owners’ love for stainless steel one day? Whirlpool introduced last year its White Ice collection of appliances, and at the time called white “the new stainless.” The glossy white appliances feature silver accents. 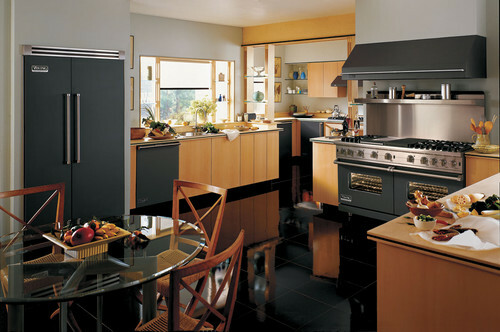 Whirlpool also offers a Black Ice version — black appliances with silver accents. General Electric is offering up slate as an alternative. The low-gloss gray finish is “inspired by the rich texture of stone” and “provides a warm, inviting alternative to stainless steel,” GE says on its website. GE also notes that the dark matte finish hides fingerprints, smudges, and dirt. Viking Range offers several various colors of appliances, such as in cobalt blue. Viking Range Corp., which was a pioneer in stainless with its debut in 1987 of a stainless steel open-burner range, is providing home owners a colorful array of options with appliances. It has 24 color alternatives, from cinnamon, wasabi, kettle black and Dijon to plum, sea grass, and cobalt blue. Or, the company’s graphite gray may be a little less bold for more home owners who are looking to make a switch from stainless. I’ve been looking forward to seeing a return to white kitchen appliances. White looks very sanitary, is completely neutral and pairs with every cabinet style. Stainless is industrial looking, not inviting and marks easily. I’ve never heard anyone look at white appliances and time stamp the period of design. Love the ice-glazed in the photo! I agree that stainless steel are very industrial looking and do show every single spot or smudge. I’m happy as long as we don’t go back to the avocado, mustard, or blue colored ones!!! I am kind of a rebel in that, if it’s popular then I want something else. I don’t like to be controlled as what to like or not to like. So anxious for the popularity of stainless appliances to fade away. I am hoping that other more affordable appliance companies will follow Viking in adding color selections. Big Chill has some fun ones. Love the stainless and the Slate. I don’t personally care for the new ice-glazed. White appliances yellow with age…nothing yuckier. I like the new ice white and the glass fronts may prevent yellowing. I think slate would be the way to go…low upkeep and half white/black…totally neutral like the stainless …BUT you’d be married to one brand! I will stick with stainless for now. I used to love black but it now looks plasticish next to stainless. Loved what Martha Smith said! That’s what I hate about white appliances. But the white ice looks promising! I love the “slate” appliance look and I am not a fan of ice glazed. I think stainless will be around forever in high end homes, but it has already been dethroned in the middle class homes. Aluminum runs wild in middle priced homes in South Florida, and many people still believe that they are getting a stainless producr. Although stainless has a clean look to it, it’s industrial looking and feeling. It wasn’t that long ago when only restaurants used these finishes. I happen to have stainless, glass (clear on top with white backing), and wood paneled appliances in our family homes. My favorite for cleaning would be the white glass (kitchen aid) cooktop. It’s a breeze to clean and looks crisp white and bright even after many years. The stainless is nice as long as you don’t touch anything.. The stainless cooktop is the one I avoid cooking on if I can since it’s harder to clean and can scratch as well. Wood facing has the warmest look on a fridge and dishwasher.. They look just like a cabinet, but you can’t get a cook top in wood obviously. I do like the white ice, it’s a nice mix of white with the stainless accents. I suspect it will become popular. Great article, I agree, I don’t think stainless steel is going to be going anywhere anytime soon.